Creating a Lesson Plan allows you to figure out all the details of the work you wish to assign - explicit directions, combinations of assignments that go together, and the specific pages, lessons or chapters to be assigned - without having to tie yourself down to specific dates. 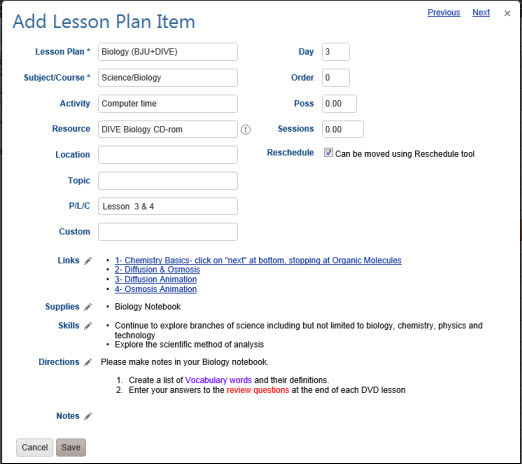 Lesson Plans can then be used to create the actual Assignments for your Students using the Scheduler tool. Lesson Plans are not tied to a particular student or school year, so you can use them over and over again throughout your homeschooling career. You can plan out the work you will be assigning without committing to any particular dates. This means that you can submit the work to the assignment grid just before you're ready to assign it - whether that's a day, week, or month at a time. It's up to you. That way, when things take more or less time that you expected, or when there are interruptions to your schedule, you don't have to waste a lot of time rescheduling things back and forth. To access the Lesson Plan area, click or touch 'Lesson Plan' under the 'Schedules and Planning' section of the HSTOnline menu. To optimize performance, the Lesson Plan displays no more than 500 items at a time. If you have more than 500 items in a Lesson Plan, the list will be divided into additional pages of no more than 500 items each. Searching or filtering a list will search the entire list, not just the items currently in view. For more information on paging, please see: Customizing the Data Display: Automated Paging. We recommend that you put items in a Lesson Plan that are dependent on each other. For example - if you have a History textbook as well as historical fiction that covers the same time period, you might want to put those items together into one plan. This will help you keep track of both types of lessons at the same time. But we would not recommend putting your Math and History in the same Lesson Plan. You may if you wish, of course, but it is probable that you will get ahead in one area and fall behind in another, and that can become confusing when trying to manage the Lesson Plan. HSTOnline will keep track of which Lesson Plan items have been used to create Assignments for which Students by marking them as 'Used' to help you stay on top of your Student's progress. Each item in your Lesson Plan has a Day number. A 'Day' represents a day of school for that subject. Lesson Plan items with the same Day value will be placed on the same date when using the Scheduler function to create Assignments. Day numbers are not tied to specific dates or days of the week. They simply provide a way to order and organize your lesson plan items. Day and date details are set as part of the Scheduler process of creating Assignments from your Lesson Plan items. If you have a Subject/Course that you only assign on certain days of the week (for example, Science is only taught on Tuesdays and Thursdays), you can use the Presets feature to assist in assigning just to those days of the week, or you can use the Weekly feature in the Day Options area to choose specific days of the week on which to assign items. So in a History Lesson Plan, all the items with Day 1 will be assigned on the first day you do History, all the items with Day 2 will be on the 2nd day you do History, etc. You can place each item on a separate Day number, or you can have multiple items on the same Day number. Day 1 and Day 2 may be Monday and Tuesday of the same week, or they can be September 1 and October 1, it will all depend on how you choose the create the Assignments when you are ready to do the work. If you have a Grammar workbook that has 180 lessons, you might create a Lesson Plan where you have one lesson per day so that it spreads out evenly over your school year. If you also have a phonics workbook, you might choose to put that in the same plan, and have a phonics lesson every other Day - so that one day there is just a Grammar lesson, and the next there is a Grammar and a Phonics lesson. You can create any pattern you like with your plans. Change Day Numbers for selected Lesson Plan items. Copy a Lesson Pan item to create more Lesson Plan items with repeating or incremented Page/Lesson/Chapter text. Below is a list of all the possible fields for any Lesson Plan item you create. The only required fields are Lesson Plan name and Subject/Course. You may enter any additional details you want or need for your homeschooling records. You can enter these details when creating the Lesson Plan item, or you can go back and add additional information after the fact using the Edit features. You can make your Lesson Plans available to other HSTOnline users and/or peruse the Lesson Plans that others have elected to share. You might find it helpful to review some of these shared plans to see if any meet your needs, thereby cutting down on the data entry you need to do, or even just to get ideas of how you might want to set up your own Lesson Plans. You can opt to share all or part of any Lesson Plan you have created. While we encourage you to share Lesson Plans you may not share copyrighted materials. Please honor the licensing rights of others. Shared Lesson Plans found to contain copyrighted materials will be removed from the Shared Lesson Plans list. If you find a Lesson Plan on the list which you believe violates this standard, please contact Homeschool Tracker Support Staff. Thank you for your cooperation. Please refer to the Sharing Lesson Plans Help Page for full instructions on sharing your plans or importing plans that others have made available for sharing. See the Export Help Page for information on other data that can be exported from your HSTOnline database. 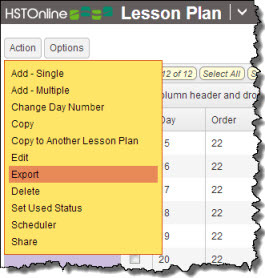 You can use the Export option in the Lesson Plan Action button to create a .CSV file of displayed items. You can then use the data in the file in whatever way you need. All of the items in the view will be included in the .CSV file that is created. There is no need to select specific items. Use the search and filter capabilities of the Lesson Plan page to limit the display, or leave everything set to 'all' to choose every possible item for inclusion. See the Lesson Plan Display and Filters Help Page to learn more about the filtering options available. On the Lesson Plan page, set the filters to display the items you want to copy to an exported file. Click or touch the Action button and choose Export. When the file is ready, your browser will prompt you to open or save the file. The program used to open the file will depend on your computer settings for CSV files. Typically, they are opened in a spreadsheet program. Data from all possible columns will be included in the exported file. Data appears in the export file exactly as it does in the grid you are viewing: numbers in Links, Supplies, and Skills fields; asterisks in the Dir (*) and Notes (*) fields, the first 150 characters in the Directions (Preview) and Notes (Preview) fields. Use the features of your spreadsheet or other program to adjust column widths, sort data, and make whatever other changes you wish.